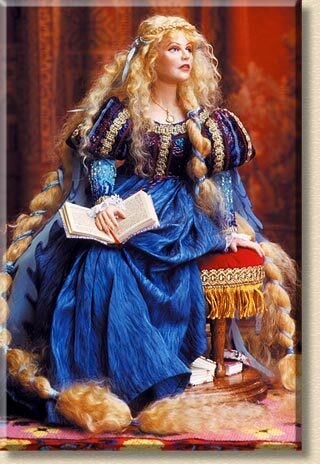 Rapunzel with her long golden hair, was locked in a high tower by a witch. With nothing else to do all day but read, books are piled under her seat. She pauses - is that the witch she hears? Media: Head, hands and feet of Super Sculpey, on a wire armature, with a cloth body. She has very long blonde mohair, made longer by twisting a long wefted length of mohair, braiding some sections, and wrapping others with silk ribbon. Her skirt and lower sleeves are of blue brocade. Her bodice is a darker metallic blue, as are the upper puffed sleeves. She has long sheer dagged-edge hanging sleeves. Props: She sits on a handmade wooden bench upholstered with red velvet and gold fringe. She holds a handmade book open on her lap, and there are several more under her seat.